The 87th Academy Awards was for the birds. Well, a Birdman, at least. It was a very long evening of self-importance, hosted by Neil Patrick Harris. The evening began with a great song and dance highlighting past movies. Jack Black made a brief appearance and was killing it throughout the song. There were even some Stormtroopers that made cameo appearances in the great (if too long) song. Teegan and Sara are joined by The Lonely Island (along with a ton of all-star talent — including Will Arnett in a Batman costume) for an amazingly energetic performance that was quite the spectacle. Why can’t every Oscar-nominated song be so fun? And where can we get one of those LEGO Oscars? They’re great! Several award winners immediately overstayed their time, but when one started talking about suicide prevention, the music quickly stopped. That was good timing. Many of NPH’s jokes are flat and unfunny. The show feels uneven. Falling asleep and losing interest until all the geek-related movies duel, with Interstellar the Visual Effects champion. No awards for Guardians, Hobbit and X-Men. A slight upset victory for Big Hero 6 winning the best animated movie, but with the muscles of Disney and Marvel teaming together, while we didn’t expect it, we’re not surprised! Lady Gaga shows off her incredible vocal range in a tribute to The Sound of Music, but really felt too self-indulgent (and that’s saying something for a show that goes out of its way to praise itself). The Grand Budapest Hotel lost the award many people thought was a lock for Wes Anderson: Writing — Adapted Screenplay. So that begs the question: How much of the story was actually adapted? It was a loaded category, full of many great scripts, but of all the nominations, this one seemed like a sure bet. 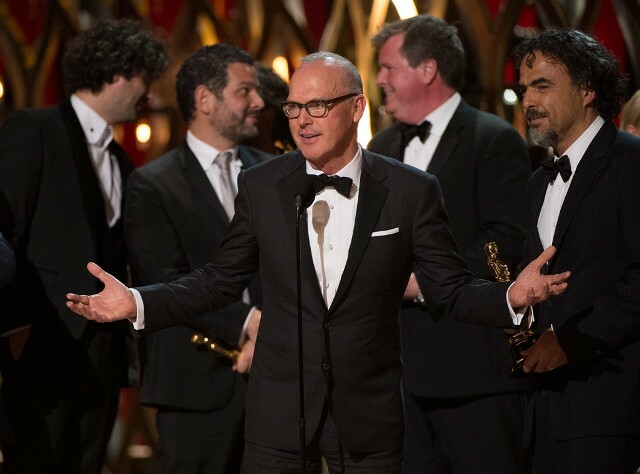 Birdman proceeds to win best directing. We didn’t see that one coming. Maybe people couldn’t get past Anderson’s quirkiness factor? Keaton loses his nomination, sadly. We were pulling for him! Then Birdman proceeds to round out the evening with more wins (Original Screenplay and Best Picture to go along with Best Director). Overall, many jokes bombed and felt forced, Neil Patrick Harris appeared on stage in his tighty whities, politics were played, as usual (women’s rights, civil rights and illegal immigration were just a few), which led to our ultimate prediction: American Sniper was locked out of all major categories. We’re not sure how Neil Patrick Harris did that final lockbox joke, but it didn’t really matter, in the grand scheme of things. This wasn’t the best awards show of all time. Not by a long shot. The show started off great, then fell downhill quickly… off a cliff. We didn’t think the best movies were even nominated (let alone won). We’ll see if next year’s batch of movies will be any better. We can only wish next year’s Oscars can keep our attention (and hopefully keep us entertained, as well) for the entire show. Is that too much to ask?